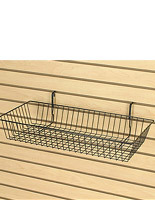 Wire slatwall baskets hold loose merchandise, magazines, newspapers, and other small objects. These crates are great for accessorizing any retail display and showcasing your products. Wire slatwall baskets and racks fit perfectly in the grooves of your existing slot wall fixture without any tools, adhesives or hardware. Simply slide the crates into the channels of the unit to showcase your retail merchandise. 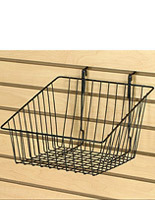 Because wire slatwall baskets are so simple to use, retailers can change their display around at any time to cater to their customer base. Metal displayers and bulk bins are a very popular marketing tool to take advantage of. Why should I choose these metal crates to display merchandise? Wire slatwall baskets have a rugged structure that allows the customer to have a full view of the products being presented. Showcase samples or small bulk objects such as travel toiletries — any tiny product lends itself well to these crates. 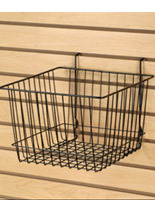 Metal bins are an economical choice for retailers — purchase one or multiple to use on the slotwall panels in your store. The more crates you purchase, the more freedom you have to showcase your merchandise. Slotwall merchandisers are efficient and flexible. Rotate them around your display to create the perfect presentation. Their rugged design allows them to hold up to the everyday wear-and-tear of a store setting. These crates are very popular in convenience stores, clothing boutiques, and gift shops for selling product merchandise — essentially any retail setting. 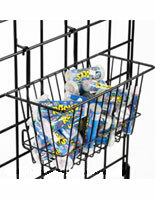 In addition, these bins can be combined with any of our slot wall accessories to add variety to your display. Our selection includes stand-alone towers, panels, hooks, and face-outs. Mix and match styles, colors, and finishes for an appealing looking presentation. Shop online at Displays2go to outfit your retail store effectively for your customer base!